Bogota-based Zaira Pulido has been asking every one of her friends and people she's into for strands of their hair to use in a series of embroidered artworks. She uses human hair instead of the usual thread and creates various works, like embroidered portraits of her friends (each made with their own hair), an embroidered comb or a replica of her bra. 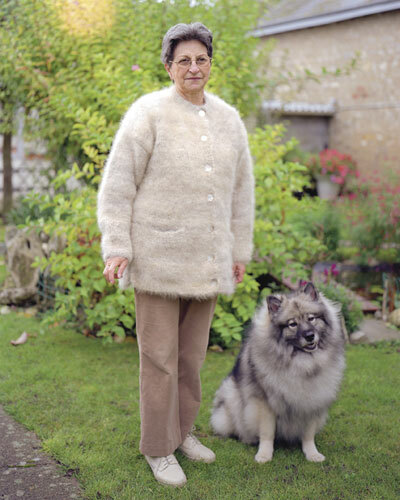 Doumé Jalat-Dehen makes wool out of dog hair and then her customers make sweaters from the dog wool. Photographer Erwan Fichou went to visit her in Brittany, where Doumé gave him the names and addresses of some of her clients. Erwan then set off across France and Belgium to meet them and take their pictures. It takes about seven years to gather enough dog hair for a sweater. First of all, you can't just pull the fur out! That's inhumane, plus it's cheating. You just have to brush your dog regularly and save what comes off. Then you mail your precious collection of Rover fur to Doumé and she will return it to you in a 50-gram ball of dog wool. 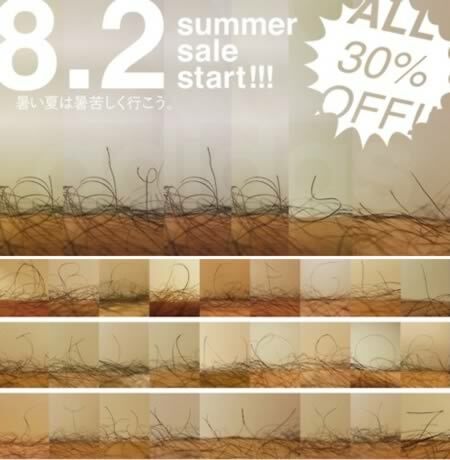 A student at Tama Art University in Japan named Mayuko created a western typeface composed of leg hair (presumably not her own). It's not the easiest to read, but may well go down in typographical records as the strangest font to actually be used commercially! Shown here is an Adidas ad using the leg hair font. 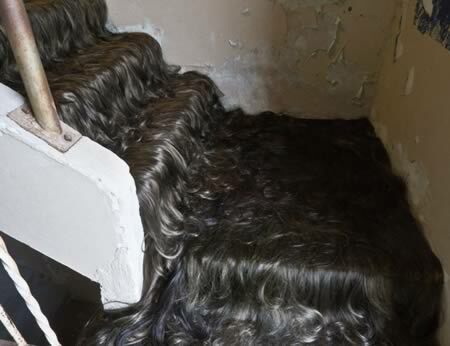 Hairy Stairway art installation in the abandoned Mountainaire Hotel in Hot Springs, Arkansas, by Jessica Wohl. NOTE: As cool as it looks, this art installation was made with synthetic hair. 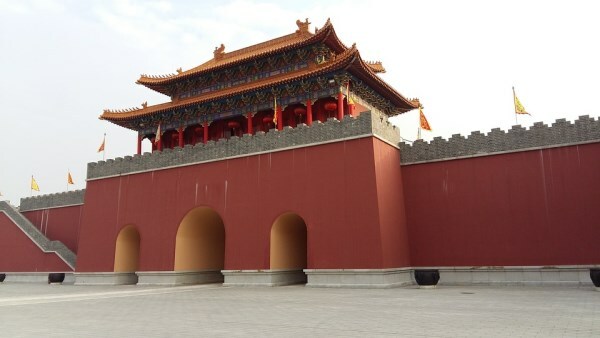 Hairdresser Huang Xin made a 3-foot replica of Beijing's Gate of Heavenly Peace out of the hair of his customers! He did this to celebrate the 60th anniversary of the founding of Communist China. A unique tunic-like dress, made out of countless human hairs, was presented by a model, in the center of Vietnam's capital, Hanoi. Kim Do, a Vietnamese hairdresser created this tunic made from hair. The material for the dress was gathered from 54 different people across Vietnam, including popular local artists like Le Dung, Thanh Lam, Hong Nhung and Ha Kieu Anh. 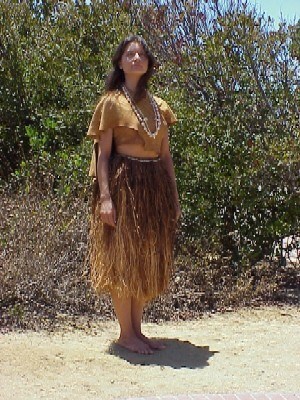 The 1 million meters of hair were then dyed and sewn into a dress, using a needle. On the front side of this unusual garment you can see the shape of a dragon, made from long brown hair. Kim Do's hair dress comes with a hat, also made from hair and decorated with the design of Vietnam's Turtle Tower. 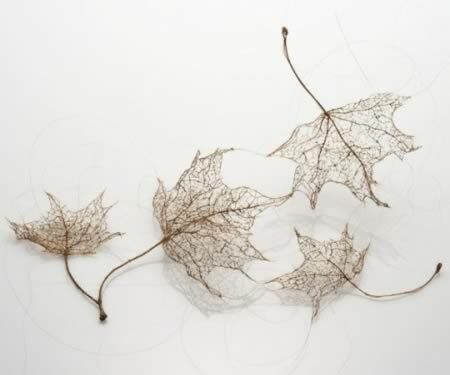 Jenine Shereos's delicate leaf sculptures look like the real thing from a distance, but they're actually made of hair. She made them by stitching the hairs together on a backing, then dissolving that backing in water. To celebrate President Barack Obama‘s visit to China, Huang Xin, the same man behind the Tiananmen Square model above, created a small sculpture of the U.S. head of state, from human hair. 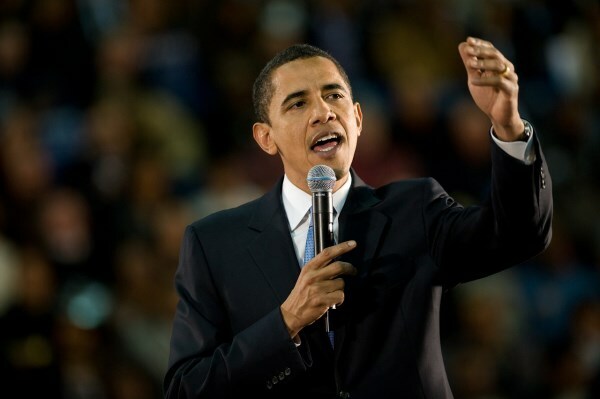 The Chinese hairdresser spent seven days and seven nights making Hairy Obama and used four kilos of human hair. Finally! Surely we've all dreamed of wearing glasses made out of hair! This piece by Azusa Murakami and Alexander Groves, has a rather nice woodgrain appearance, don't you think? More importantly, it's eco-friendly. The UK beauty industry imports 15 million pounds worth of human hair per year. As the world's population continues to increase, human hair has been reimagined as a viable—importantly renewable–material. 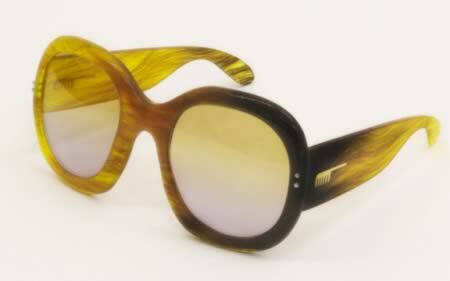 Hair Glasses are composed of human hair with bioresin as a binding agent; the frames are 100% biodegradable and no harmful substances are released during production. 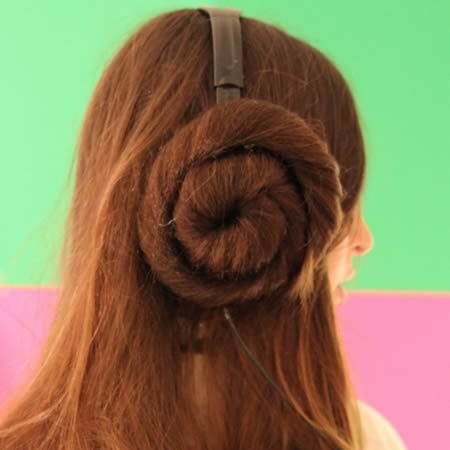 Made of synthetic hair, these pieces will transform your headphones or ear muffs into Princess Leia's famed cinnamon bun hair. Your friends will love you more, your coworkers will be jealy, and if you wear these to Comic-Con you will get laid instantly. Each purchase comes with two 6-inch diameter buns with mesh backing, ready to glue permanently or attach temporarily to your own headphones (instructions come in package). Yes, you can also attach the buns to your own hair because bobby pins exist. By Etsy seller JacquieLongLegs. In a beauty pageant, every edge helps. Every feature must be perfect, every strand of hair must stay in place. In this case, that's about two hundred pounds worth. This dress is made of a massive quantity of human hair. It was created by Thelma Madine and Ryan Edwards for an Alternative Miss Liverpool competition in Liverpool, UK.